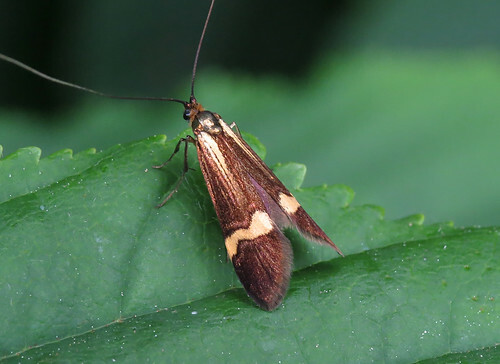 The moth list at Yorkshire Water’s Tophill Low NR in East Yorkshire rose to 617 between May 28th and June 12th with three quite unexpected species appearing on site. 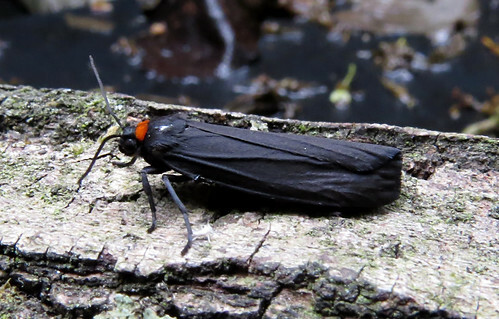 This Red-necked Footman Atolmis rubricollis on June 10th a Vice-county scarcity with probably fewer than 10 records since it was recorded in the area as recently as 2014. 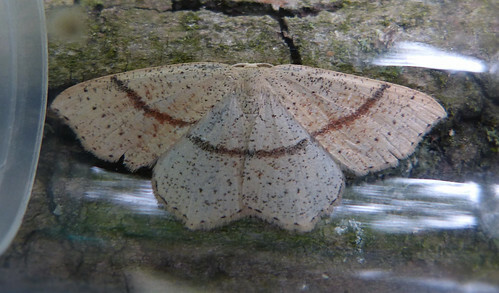 Maiden’s Blush Cyclophora punctaria, a species recorded at very few localities to the east of the Yorkshire Wolds, was trapped on June 3rd and photographed by Doug Fairweather. The highlight of the period was found in the field on May 28th. 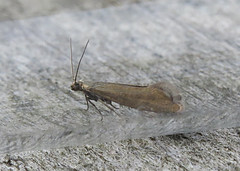 From a group of 24 moths, one was captured, identified and accepted as Dichrorampha aeratana – the first VC61 record since 2000 when the first in the area was identified. Prior to this, it had only been recorded on 12 occasions in Yorkshire following its discovery in 1983. (per Yorkshire Moths). Following a poor showing in 2015, Lathronympha strigana was seen in double figures on June 11th, but still remains confined to one very small area. A more regularly encountered day-time flyer is Nemophora degeerella which can be found in small clusters around the site. 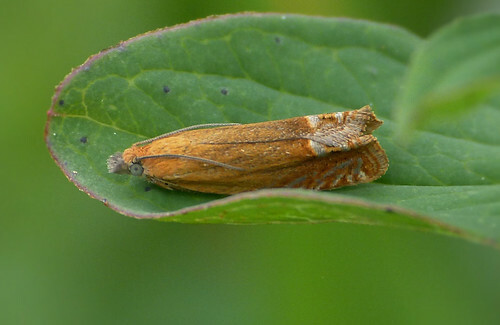 With only 67 documented Tophill records of the migrant Diamond-back Plutella xylostella since it was first noted in 2000, this June has seen a mass influx of the species from the continent. 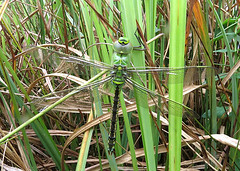 By June 4th, the numbers had become uncountable around the reserve, and even by June 12th and the return to some wet weather, the species was still around in some number. Following the first two Small Elephant Hawk-moth Deilephila porcellus 12 months ago, the species has been attracted to light on numerous occasions since May 25th in small number which suggests the site now holds a small population, as the species continues its expansion in the region. 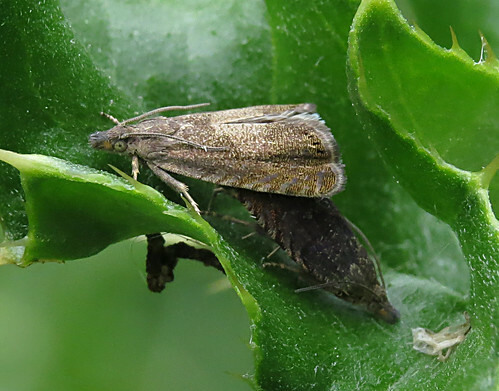 The Seraphim Lobophora halterata has been recorded for the third successive year following a 15 year absence from the annual list, while Tophill’s tenth Green Silver-lines Pseudoips prasinana was attracted to light on June 11th. 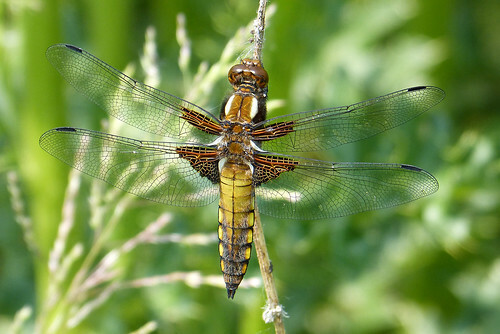 The indifferent Odonata season continues with further new species emerging – the first Broad-bodied Chaser Libellula depressa was on the wing on June 4th, photographed by Doug Fairweather. As ever, for the full comprehensive round-up of Tophill news, check out the official blog here.